"I have spent most of my ministry living and serving on estates. One of the best parts of this for me at the moment is travelling across the country to visit groups of estate church clergy in a city or diocese. It’s a great delight to encounter colleagues who are doing faithful and creative ministry, often in very tough areas. I always come away encouraged and energised. "Estate ministry and estate churches have a distinctive nature. The parishes are largely made up of council or ex-council housing, often on the outskirts of urban areas. People living in them often experience high levels of deprivation, although they often meet this with great resilience. There are often issues with education and with self-esteem. "Austerity has led to the social fabric of estate life being squeezed and threatened. Many people in these neighbourhoods are struggling with the basic necessities of life, things like a home, food, clothes, warmth, at a time when a lot of the vital support to negotiate the systems is being stripped away. Many estate churches are working out ways of feeding people – especially children – during the summer holidays; the excellent and essential children’s centres here are facing closure due to the cuts; the number of police around has shrunk. "Most estate churches are deeply involved in the fabric and life of their parishes, often through actions and partnerships that seek to serve the community. Over the past couple of weeks I have seen churches engaged in imaginative children and families work, including a Holiday Kitchen; a School Uniform Swap; Places of Welcome allow people to drop in for a cup of tea and a chat. "However, many estate churches face problems of capacity and congregation sizes are often small. There is often a feeling of not being understood by the wider Church. "In much of the country, people who live on estates come from a predominantly white working-class background, although in some areas there is fast demographic change. This can result in a damaging gulf between the culture and assumptions of the Church in its national and diocesan forms and how it exists on estates. This can take the form of assumptions that a middle-class lifestyle equals a Christian lifestyle; assumptions that people have spare money or access to computers; to what can be a deep-rooted feeling that you don’t belong. "Renewal and Reform has put a strong emphasis on estates and evangelism; seeing flourishing churches on estates as a Gospel imperative, as a response to under-investment in the past, and because things that work on estates are likely to work anywhere. "I have become Chair of the National Estate Churches Network, which has more than 20 years of experience in the area of ministry and is presently renewing itself as an independent but close partner to the Church of England’s new energy for estates ministry, representing estate churches, ministers and workers. We have a Kairos moment, a moment for urgent gospel action, where we can help our estate churches to flourish. "A key part of this is in forming groups of estate clergy in local or regional areas. There are many ways in which they can function, but they help us thrive and flourish, giving a corporate space to build and articulate vision, overcome isolation, share good practice, identifying particular training needs, reflecting theologically from our contexts, support those new to estates ministry, and offer mutual support and encouragement." 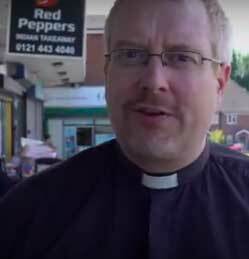 Andy Delmege is Vicar of St Bede’s Church in Brandwood, south Birmingham. He is Urban Estates Mission Enabler in the Diocese, and is Chair of NECN.